Argus was a giant from Greek mythology, normally referred to as Argus Panoptes to distinguish him from the numerous other individuals named Argus that appear in mythological tales. Stories tell of the gigantic Argus being a hero, a servant of the gods, and also a villain, and ultimately Argus Panoptes would die at the hand of the Olympian god Hermes. There is no clear agreement about the origin of Argus Panoptes in the ancient sources, although the most common theory was that Argus was the son of the goddess Gaia, with no father. Many other different parents of Argus Panoptes were put forward in those sources, including Argus, the founder of Argos, and the Naiad Ismene; Agenor, a grandson of King Argus; Arestor and the Naiad Mycene; and the Potamoi Inachus by either Melia or Argia (both Oceanids). Nominally, Argus Panoptes was said to reside in the Argolis upon the Peloponnese, the region named after King Argus, hence why Argus Panoptes might have been thought to be a descendant of the king. Argus Panoptes was gigantic in stature, and had immense strength, but what set him apart was the fact that he was adorned with a hundred seeing eyes. Hence the suffix Panoptes, meaning “all-seeing”. The eyes were either spread across his body, or simply found upon his gigantic head. As a result of having so many eyes, Argus Panoptes was said to be always awake for only two eyes went to sleep at one time, ensuring that 98 eyes were always functioning. In his role as hero, Argus Panoptes was said to have killed a monstrous bull that was ravaging Arcadia, and Argus would subsequently make use of the hide of the bull as his cloak. Argus Panoptes also assisted the Arcadians by killing a Satyr who was stealing their cattle. On the Argolis, Argus Panoptes was said to have avenged the death of King Apis by killing the king’s murderers, Thelxion, possibly a King of Sparta, and Telchis. Argus Panoptes was also used by the gods, and in some tales, Hera sent the giant to kill the monstrous Echidna, for she was a danger to traveller who passed by her cave in Cumae. ​Many other stories dispute this story though, for they say that Zeus had allowed Echidna to live for ever in Cumae after the death of her partner, Typhon. Hera, though certainly did make use of Argus Panoptes as a guard. Hera had almost caught her husband Zeus in flagrante with the nymph Io, but Zeus had quickly transformed Io into a beautiful white heifer. Hera was not fooled though, and asked for the heifer as a gift, and of course Zeus could hardly refused. 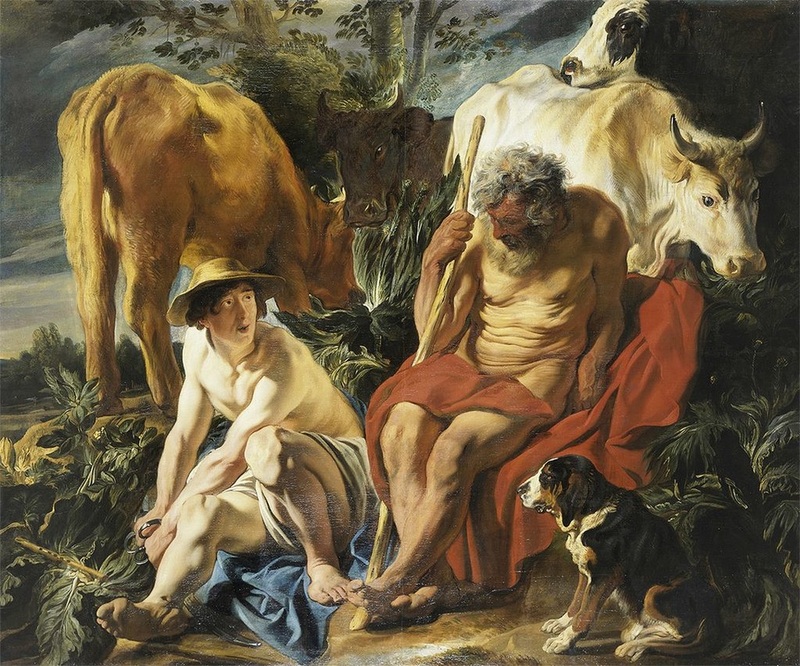 Hera then appointed Argus Panoptes as a herdsman for the heifer, preventing Zeus from visiting the nymph, or transforming it back into nymph form. Thus, Io was tied to an olive tree in a sacred grove by the giant. Hera’s task for Argus Panoptes would ultimately be the death of the all-seeing giant, for the suffering of Io eventually forced Zeus to rescue his erstwhile lover. Zeus dispatched his favourite divine son Hermes to rescue Io. Although a master thief, Hermes could not simply steal away the heifer, because Argus Panoptes saw all that was going on. So, Hermes disguised himself as a fellow herdsman, and went and sat down by the giant in the shade. Hermes began to retell various stories of the gods, whilst playing soothing music upon his reed pipes. The day drew on, and the soft music caused one eye after another to close as sleep took over the ever wakeful Argus Panoptes. Eventually, all the eyes of the Argus Panoptes were closed, and then Hermes struck, either killing the giant with a stone, or by cutting off his head. Io was now free but her ordeal was not quite over for Hermes could not transform Io back into her previous nymph form, and so Io wandered the earth as a heifer until eventually she found sanctuary in Egypt. 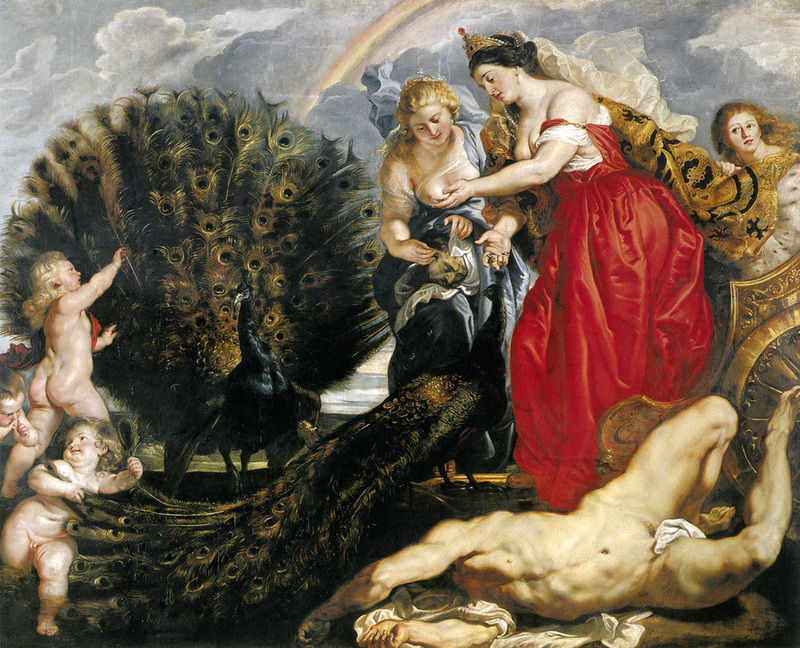 Following the death of one of her favoured servants, Hera took the eyes of the deceased Argus Panoptes, and placed them upon the feathers of her sacred bird, the peacock. Occasionally, Argus Panoptes is named as father to Iasus, a king of Argos, by the Naiad Ismene, daughter of Asopus. Iasus, in Greek mythology though, is named as a son of many different individuals.